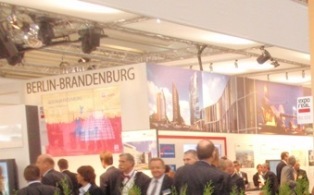 From 5 to 7 last October, CEPI was present at the real estate fair of Munich, in association with the German association "Immobilien Verband Deutschland" (IVD). Timo Multanen, Jan Boruvka, Claudine Speltz, Frans Burgering, Hans Langemaack and Xavier Ortegat, who represented CEPI at ExpoReal, had very busy agendas: at the invitation of the association of Russian administrators and developers GUD, we participated in a debate on the challenges faced by property managers and on possible exchanges between professionals of Western and Central Europe. Transnational markets were also discussed with the president and administrators of CEPI, during the exchange of views organised by IVD at its stand, to which a large number of German professionals had been invited for a buffet. Conversations with colleagues on the Dutch stand, encounter with the Hungarian delegation led by Miklos Nemeth, working meeting with the Executive Director of ICREA, brief exchange of views with a delegation of National Association of Realtors, hello to Joachim Schmidt (DDIV), Peter Graf ( DIA) and Professor Schulte (University of Regensburg) in the crossing of paths, on stands, at the bar or even in the airport’s business centre: the real estate fair offers above all to the numerous professionals present opportunities to meet and make business. A working meeting with representatives of CEI was also on the agenda of the CEPI, EPAG and CEAB Presidents. Both associations expressed their wish to define and investigate collaboration which would ensure a maximal representation of real estate agents, as well as services of high quality. Thanks also to Jens-Ulrich Kiessling, Hans Langemaack and IVD for the convivial evenings in the city centre, still marked by traces of the recent “Oktoberfesten”.